It was not the stark cemeteries or overgrown battlefields that touched me most while touring First World War sites in Flanders, but a simple house on a quiet side street. Situated about 10 kilometres behind the front lines in the Belgian village of Poperinge, Talbot House opened in 1915 as a place of rest for soldiers of all ranks. Though the village, affectionately referred to as “Pops” or “Little Paris,” was close enough to the action that the din of battle was nevertheless audible, it was far enough away that troops could escape the immediacy of direct combat and grab some R&R. Today the site is a small but well-preserved museum. When I sat under the wisteria in the walled garden and closed my eyes, it was not difficult to summon up the sounds of life here during the war – the clatter of teacups, murmured conversations, the notes of a tinny piano and accompanying voices singing Pack Up Your Troubles in Your Old Kit Bag. The domestic details revealed another face of the soldier’s life, showing him with his helmet off, a hot “cuppa” in hand, surrounded by his mates. “Most people don’t realize that soldiers didn’t fight all the time,” the museum guide explained. 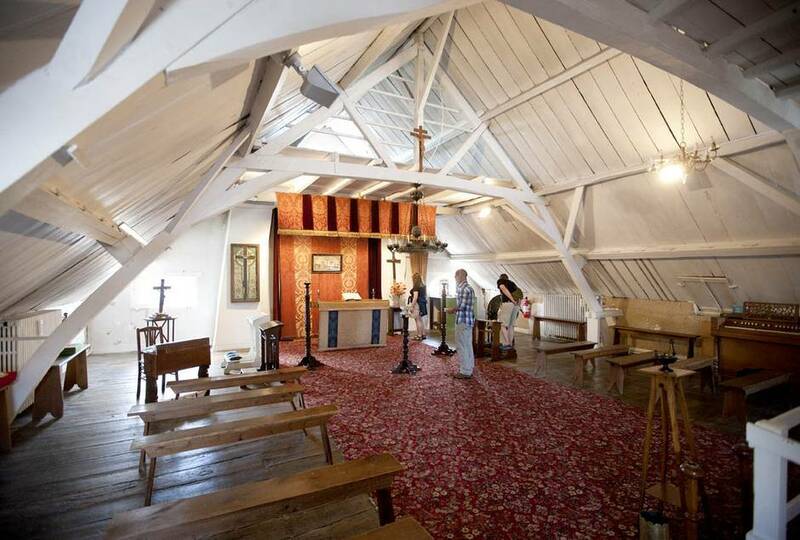 “They had leave, and when they did, they wanted to do things that would be life-affirming and that perhaps would bring back memories of home.” Talbot House featured an extensive garden, a workshop, a library and, in the attic, a spare but lovely chapel. The old hops barn was the site for concerts and Charlie Chaplin movies. 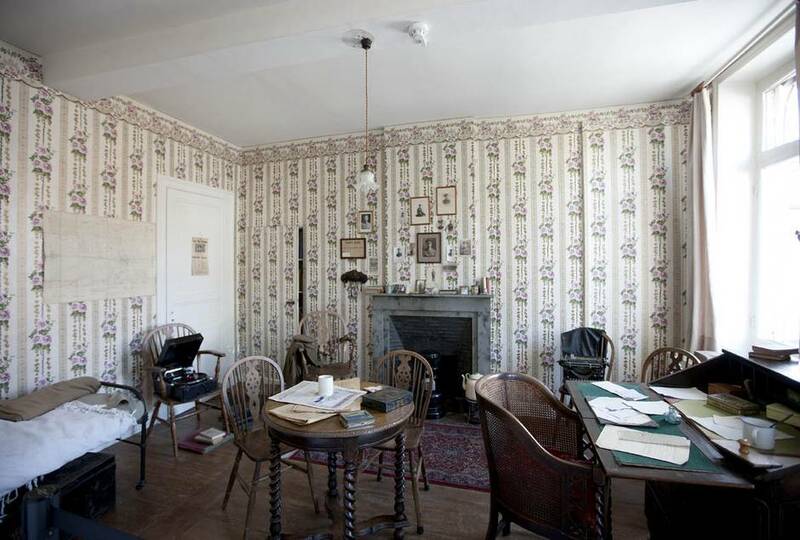 Soldiers could overnight in the upstairs bedrooms or hang out in the canteen. It was a corner of sanity in the middle of chaos for those who craved, if only for a brief time, a slice of real life, some camaraderie and solace. When they left Talbot House, soldiers returned to the reality of trench warfare in Flanders, the area of Belgium that I had come to see. While touring war cemeteries and museums may fall into the category of Dark Tourism, I consider it meaningful travel – a journey that helps me understand something foreign and far removed from my personal experience, but that forms part of my history nonetheless. It is a disturbing juxtaposition, to view thriving green fields and prosperous towns where once some of the worst battles of the war were fought, but it is a way to preserve memory, to honour sacrifice – and to celebrate peace. Surrounding Poperinge are the Flanders Fields that hold memories of the First World War. As the centenary of the war years continues, Belgium has become an important destination for those who want to remember. A multitude of special tours, hotel packages and commemorative events are planned through 2018. 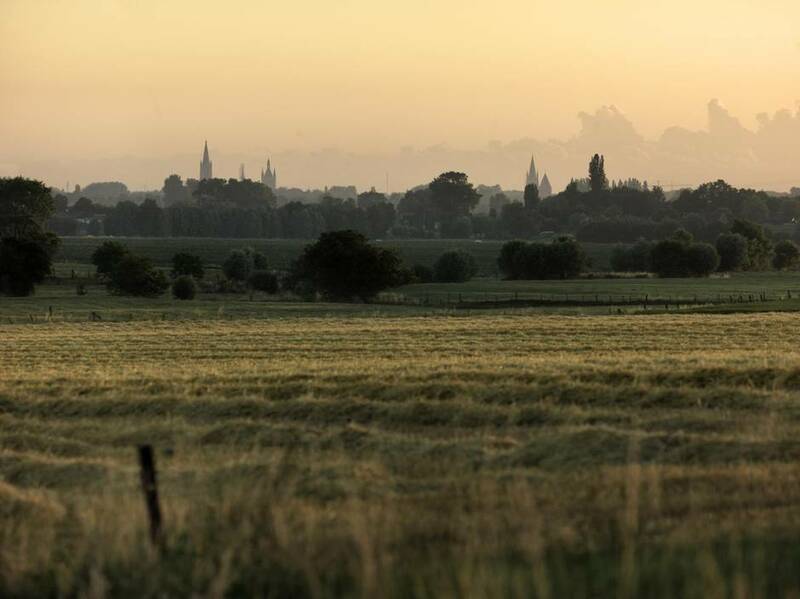 A century later, Ypres blends into the lush, bucolic countryside. These battlefields hold particular significance for Canadians. One hundred years ago this April, Canadian troops made their first major appearance on a European battlefield, at the Second Battle of Ypres, and gained a reputation as a formidable fighting force. But the cost was high: In 48 hours, 6,035 Canadians – one in three – became casualties. During four years of battle, close to 600,000 soldiers were killed or went missing in this part of Belgium, known as the Westhoek. More than half of these came from Great Britain, Canada and other Commonwealth countries, and they lie buried in the 170 cemeteries that surround the city of Ypres. On the days I visited Flanders Fields, the weather was suitably sombre. Rows of white crosses, marble ones today replacing the temporary wooden crosses used in wartime, stood out in sharp relief against a dark sky. In a slow downpour, I toured the concrete bunkers used by the medical corps to administer first aid. It was here, on May 3, 1915, at what is now Essex Farm Cemetery, that John McCrae wrote In Flanders Fields. I memorized that poem in elementary school, have heard it recited numerous times at Remembrance ceremonies and can repeat it effortlessly word for word. It has never failed to move me, but visiting its inspiration made it tangibly real. The Canadian soldier and doctor rested against the damp wall of this bunker, surrounded by the wounded. 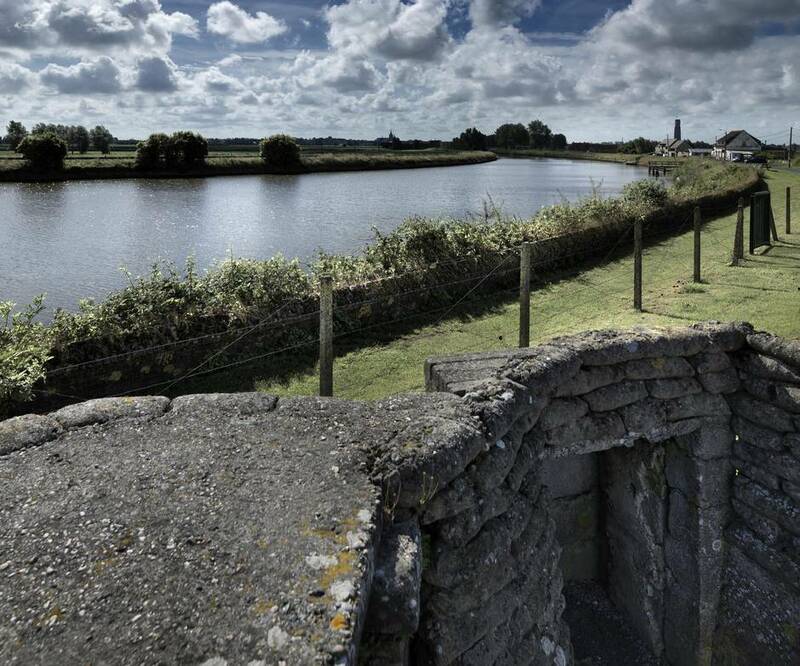 He would have heard the battle raging just a short distance away, where his brigade’s batteries were in position on the west bank of the Ypres-Yser canal. In a letter home McCrae described the scene: “For seventeen days and seventeen nights none of us have had our clothes off, nor our boots even, except occasionally. In all that time while I was awake, gunfire and rifle fire never ceased for sixty seconds.” His close friend, Alexis Helmer, had just been killed. Under these conditions, he scribbled the lines that would come to define the courage and patriotism of his time. His work is a poem devoid of artifice, a heartfelt outpouring of grief and a hymn to duty. Tyne Cot Cemetery is the largest Commonwealth military cemetery in the world with almost 12,000 graves. Between Passchendaele and Zonnebeke is the Tyne Cot Cemetery, the largest Commonwealth military cemetery in the world, with almost 12,000 graves and a commemorative wall remembering 34,957 missing soldiers. If a cemetery can be said to be beautiful, this one is. Three kilometres away is the Passchendaele 1917 Memorial Museum, newly expanded and featuring a realistic reconstruction of the bunkers and trenches that spiderwebbed this area during the years of the war. At the Lijssenthoek Cemetery, which was used by the Casualty Clearing Centre during the war, the sun came out. That’s when I could see how white the crosses are, how carefully the grass is tended, how reverently flowers and poppies are placed. The visitors centre highlights the life stories of the more than 10,000 casualties buried here. In Ypres (Wipers to the British soldiers who were stationed here), the In Flanders Fields Museum has reopened after a complete renovation. 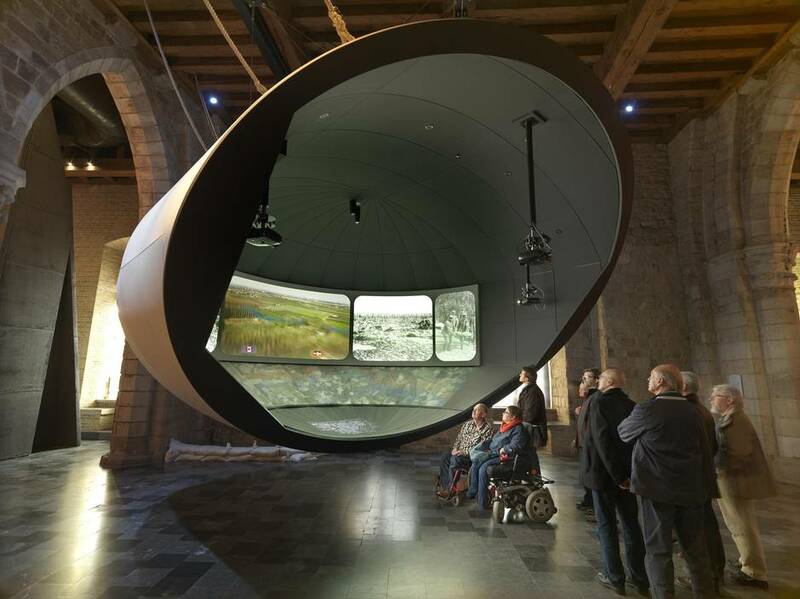 Devoted to telling the story of the battle of the Ypres Salient, the museum embraces the latest technologies to create a moving interactive experience. Visitors receive a poppy bracelet that includes a computer chip. Once you enter information about your age and country of origin, a swipe of the many terminals calls up an individualized history. It is an absorbing and disturbing exhibit, one that requires attention and time. Most compelling for me were the small intimate artifacts – the boots and bindings of an Allied soldier, the contents of a German soldier’s wallet. Outside the museum, life has moved on, and there are few signs of the destruction that Ypres suffered. A busy café culture provides colour and bustle. The rebuilt medieval-style buildings, devastated by bombing and rebuilt carefully postwar using the original architectural plans, house chocolate shops, coffee bars and patios. At Het Moment, on Boterstraat, I indulged in a platter of carpaccio and arugula, followed by grilled white asparagus – just in season in early May – topped with a Flemish sauce of chopped eggs, cream, butter and onions. At De Fonderie, the main course was pork with Blackwell sauce followed by fresh Belgian strawberries. On Saturdays, the main square is home to a large farmers’ market, offering fresh bread, local cheeses and handicrafts. Each of the tidy streets that radiate out from the square is lined with busy stores and restaurants. No one who endured the Great War is alive; the last veteran of the trenches, Harry Patch, died in 2009 at age 111. A trip to Flanders is a reminder that we must now become the witnesses: the ones who visit, acknowledge and remember. It’s a journey both haunting and surprisingly uplifting – a passage through history and a celebration of regeneration. Several airlines, including Air Canada, Icelandair, Lufthansa and United, fly from Canada to Brussels, where frequent and convenient rail connections can get you to Ypres and almost any town in Belgium. The Airport Express train in the basement of the Brussels airport runs connections to the central rail terminal four times an hour. Ypres is centrally located for touring the First World War sites. For information on touring the war cemeteries in Flanders, visit greatwarcentenary.be, which also provides useful information about places to stay in the Westhoek. Information about various Great War cycling routes is available at flandersfields.be/en. Activities designed to honour the memory of those who fought in the First World War will be held all over Belgium through 2018. Here are some highlights. The writer was a guest of Visit Flanders. It did not review or approve this article.